you are the brownie queen. in my dream life, i would live in your spare bedroom and eat your cooking and baking all day every day. oh I’ve never met a brownie I didn’t like. Will def have to try these! Thanks for sharing. That ad made me so emotional Richa, I cried. and I went to India in May this year so it’s not like I haven’t visited for a long time. But it made me miss mom and dad so much, the festivities, my home, my room, I miss everything. I am going to have to try these! I have never had too much success with baking with coconut flour. thanks! Richa you are a miracle worker! A vegan & GF brownie that looks amazing and dare I say it, is almost healthy (hey, its got some good stuff in there with the chocolate! ), Its so difficult to make a brownie without eggs, all the recipes I’ve tried go all weird and sort of toffee like, but yours looks fantastic. Can’t wait to try this tomorrow for afternoon tea. Thanks for sharing all your amazing recipes with us. I actually just bought a bag of coconut flour to start experimenting with it (never used it before)…this sounds like a perfect first recipe. 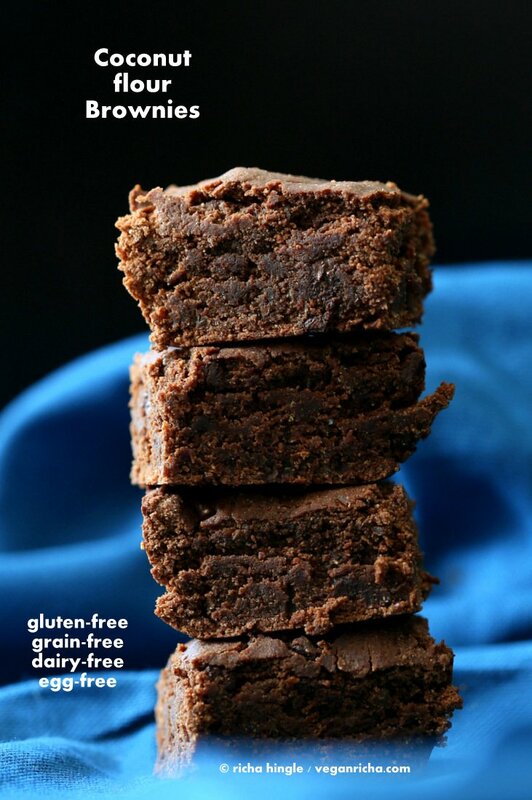 Plus, I’m always on the lookout for good gf, vegan brownie recipes! thanks Richa! Oh I’m so excited to try these! I love using coconut flour. I’ve been making a chocolate banana bread with coconut flour, but this recipe looks awesome as well. Thanks for sharing! Can you share your chocolate banana bread recipe!? 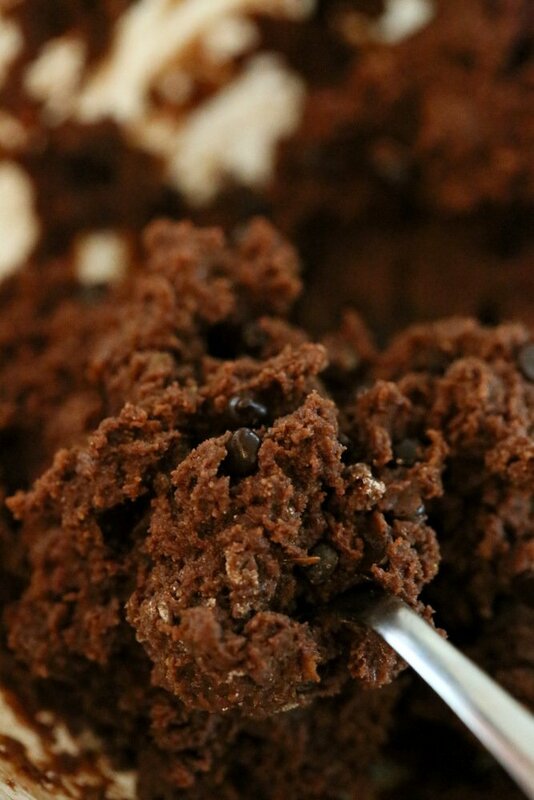 I am eager to try these…paleo and vegan is a tricky thing in baking! Featuring them this week Richa! PS, making another batch of dosas this week! Hi. Great recipes, thank you! I made these yesterday , everyone loved them. They were super crumbly though so I probably could have added more milk maybe? I made the crumbly ones into cake balls by stirring them up with some milk and rolling in coconut. Those were a hit too! The remainder of the pan are fine today– not too crumbly at all, just right! My kids and husband all gave thumbs up and I’m so happy that they are yummy with nutritional value. I’m really looking forward to trying more. Thank you so very much for all your hard work! yes add a bit more milk or more flax. They probably do soften as they sit, so becomes less crumbly. so glad you all loved these ! you can also add a chocolate ganache on top after they are done baking, that will keep the brownies moist and less crumbly as well. can you omit the maple syrup and add more stevia? would t affect the texture too much? you will need more liquid in the recipe if you omit the maple. maple also binds the brownie. you can use 1/2 cup non dairy milk instead. the brownie will be more crumbly though so you might want to add some gum. Approximately how many oz is 1/2 cup of a chocolate bar? 1/2 cup is 2.25 oz. the whole 3 oz bar is about 2/3 cup. These look absolutely delicious! I’m allergic to flax seeds, though. Would chia meal work? These look so good! Is there a sugar free substitute that I could use for the maple syrup (like stevia or xylitol) or does it have to be in syrup form for texture? the maple is kind of keeping the brownie together and making it fudgy. without the syrup, the brownie will be very crumbly and dry. There isnt any gum in the recipe too. You can use a different sweet syrup but something syrupy. Hi, can i substitute cocoa powder for some of the chocolate? the melted chocolate helps with the fudgyness . 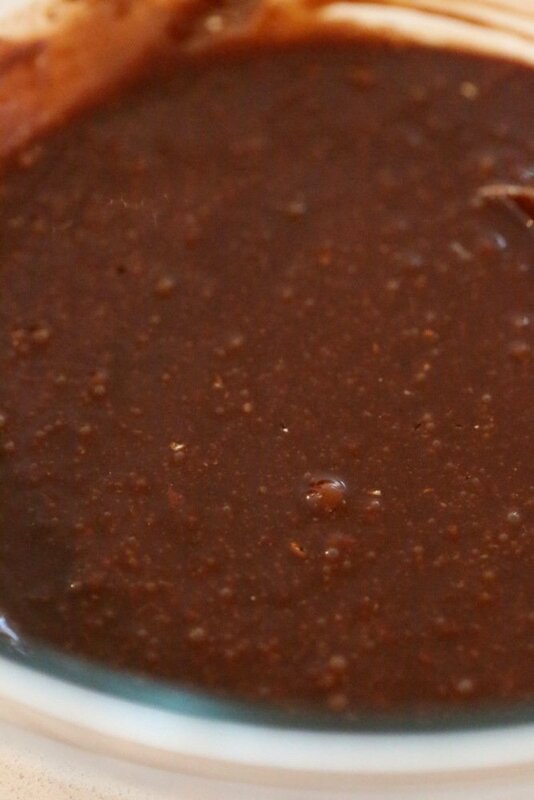 add 2 to 3 tablespoons cocoa powder for the 1/2 cup chocolate, but dont eliminate all the chocolate. I tried making this and it was heavenly. Thank you! I was depending on store bought brownies for a long time, but now I have the ingredients and the right recipe to do whenever I want. I have another question on options for GF baby’s first smash cake. I have emailed you. Please respond when you find time, my little one is turning 1 in couple of weeks and I want to bake a vegan, GF, sugar free cake for her. I came across a recipe with banana, but it is not GF and not vegan. Please help me. one more question: I thought I saw a tindora recipe somewhere in your blog and it sounded delicious. I am not able to locate it now. I made these tonight, I omitted the chocolate chips and instead used nearly a cup of dark chocolate and 2 tablespoons of cacao powder. I doubled the sugar (I used coconut sugar) and added about a 1/4 cup extra maple syrup as I’m at a high elevation. I also baked them in a mini muffin pan for 15 minutes and they were perfect! This is a great recipe and the only reason I made substitutions was to have more control over the type of sweeteners used. so glad the substitutions worked out well! I made it the way You wrote it. Thank you for sharing this recipe. I never have chocolate bars on the shelf but always have cocoa powder and coconut oil. Do you know how I would substitute the powder and oil for the bars? It might not turn out as fudgy without the melted chocolate. Try with 1/3 cup cocoa and 1/4 cup oil to replace it. mix it into the wet ingredients. Oh my goodness! These look amazing! We have a serious love of brownies at my house plus an enormous bag of coconut flour begging to be used. I am definitely making these soon! Happy Mother’s Day to me!! Thank you so much for this recipe, I’ve tried with this coconut flour http://www.tiana-coconut.com/products/coconut-superfoods/gluten-free-coconut-flour/ and a bit of coconut nectar as well and it came out delicious! These are so good and so allergy friendly! 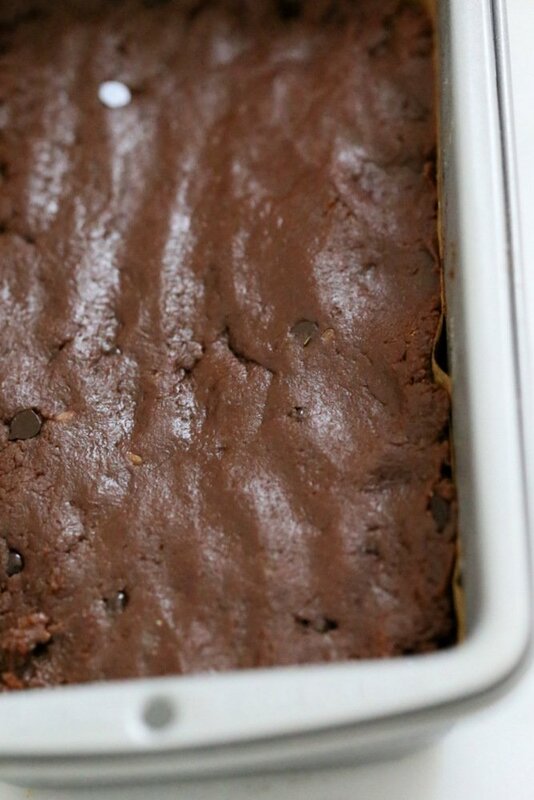 perfect for a change from the bean brownies. OMG! These are soo good! 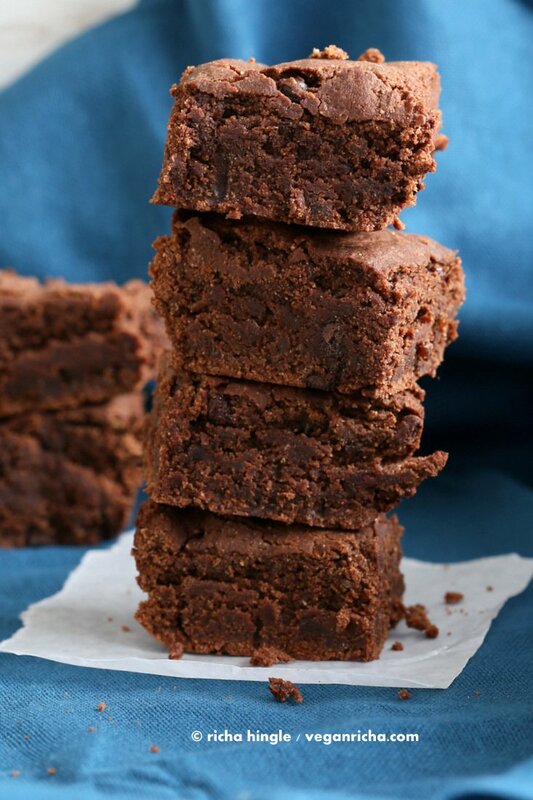 In fact, these are the most delicious brownies I’ve ever made – vegan or non-vegan. Truly addictive! Thanks for sharing, Richa! Thats awesome! thanks for making and loving them! Tried a combination of everyone’s suggestion to make as sugar free as possible as I’m trying to eliminate a yeast overgrowth. They were not very sweet to say the least, but what I added was more than a cup of Frontier Organic Alcohol Free Vanilla and Maple Flavorings. I also used cocoa powder & chocolate bars that were 88% cocoa with only 5 grams of sugar in a bar. I wish people would not waste time and space on these recipes saying “Sounds good, I’ll have to try…” Please DO TRY and post your results and substitutions! These were easy and quick to make. I think I overcooked them slightly as they didn’t have the fudgeyness others have been raving about. Any tips of how to know when they’re done? Substitutions: 1 cup melted dark chocolate in place of the choc chips and coconut nectar instead of maple syrup. Next time I’ll try with maple syrup as I think it would be richer and maybe fudgier. Also, I simply added everything to the saucepan used to heat the coconut milk – less washing up and it worked fine! coconut nectar might make it dryer and the maple syrup adds the gooey rich fudgyness to balance out the drying properties of coconut flour. these will be soft and will get less fudgy as they sit overnight. They are the fudgyest when just done. 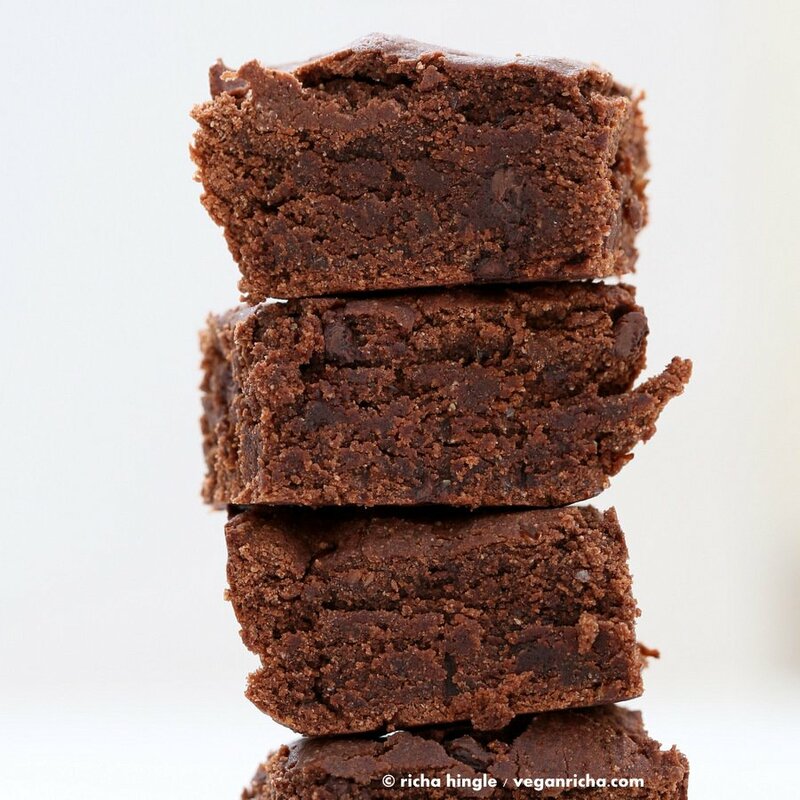 Richa, I really want to try these brownies but don’t have flax meal or psyllium. I don’t have chia either:( what can I substitute? coconut flour doesnt have any binding, so it really needs the psyllium and flax/chia. the brownie will be just a crumble without them. I only have powdered cocoa at home. Can I use that instead, 1/2 cup in the heated milk and 1/2 cup with the flour? Will I need to increase milk? Thank you. So excited to try. The melted chocolate also helps hold the brownie together. Coconut flour can get very crumbly. So I wouldn’t advice changing the recipe that much. Thank you! Can’t wait to give this a try. Hi, what low carb alternative could I use instead of 3 Tbsp cornstarch or arrowrrot or tapioca starch? As I am on a low carb diabetic diet. (Although if it would be almond flour that you suggest could i do half the amount as the calories are sooo high?) Surprisingly I already have the coconut flour, flax and psyllium so it would be good to use some other ingredient that isn’t too uncommon(and expensive) that I can use again on other recipes. Also would it be possible for you to tell me the calorie count if sugar free chocolate and maple syrup as well as low fat butter(to sub the oil) were used instead? thank you. Hi Louisa, I am not sure how you can make this recipe low carb. The sugar, maple, chocolate are all adding a lot of carbs already. With the changes to the sweeteners and the starches, the coconut flour will not be able to stay together. You might have better luck with a recipe that is already adjusted to be low-carb. Thank you for getting back to me so soon! I have managed to find chocolate and maple syrup that are pretty low in carbs. However I suppose I could do it with normal syrup if that would be the only thing that works. I’m just trying to minimise the overall unhealthiness and limit the main source of carbs, sugar is of a somewhat lesser concern for the diet i’m on although it would be ideal to be less decadent. Would there be anything at all I could use to replace the corn starch/tapioca/arrowrroot at least? It’s just so hard to find a recipe for brownies using coconut flour that have a decent amount of chocolate in it. Thank you so much for helping me. Can you use any kind of flour like wheat flour? whole wheat flour would work instead of the starches. Hmm something low carb would be more ideal for my diet, if there is anything that meets this requirement? More…. psyllium or flax maybe? nope. flax and psyllum will just make it more gel like. You might have experiment with any types of flours that you can have. Make small portions of the brownie, like a small ramekin with the subs and bake them to see how the texture and taste works out. Hello Richa! Last Sunday, I have made the coconut flour brownies vegan gluten free recipe for my family. My family likes this dish very much. It was made so delicious without being too heavy and perfect. I added the maple, vanilla, flax, psyllium and oil after the mixture has toasted. Thanks for sharing great recipe. Nice recipe! I had some coconut flour in my pantry for months not knowing what to do with it, and so I made these brownies. Since you wrote that the coconut flour absorbs moisture and that the maple syrup was necessary for moisture, I decided to use 3 Tbsp of aquafaba for the egg substitute and used flax meal in place of the psyllium husk. Honestly, I’ve been using aquafaba for egg substitutes since i recently discovered it — just because it’s so cool. I also used applesauce in place of the oil, but i do that for every recipe. That said, these brownies are stellar! I have nothing to compare them to, but they turned out quite moist, tho definitely different than your typical brownie, I couldn’t stop eating them. I decided to cut them up and freeze them, and I gotta say they taste awesome frozen! Almost like brownie ice cream? I don’t know, but now I can’t stop eating them right out of the freezer! Thanks for the wonderful recipe! Awesome! yes coconut flour is a very different texture compared to regular flour brownies. Aquafaba definitely works well as a sub. Love the idea of brownie ice cream with these! I’m curious if you’ve successfully made a cake using aquafaba and coconut flour? I’m making my son’s 1st birthday cake this weekend and he’s allergic to eggs but he also hasn’t had any grains yet. I havent made a cake with coconut flour. These brownies dont have egg or grain. You can use the recipe to make 2 small round thin cakes that you can layer with a frosting to make a birthday cake. What is the best way to measure 1/2 cup for the dark chocolate bar, like by volume when its melted or by weight, 120 grams??? 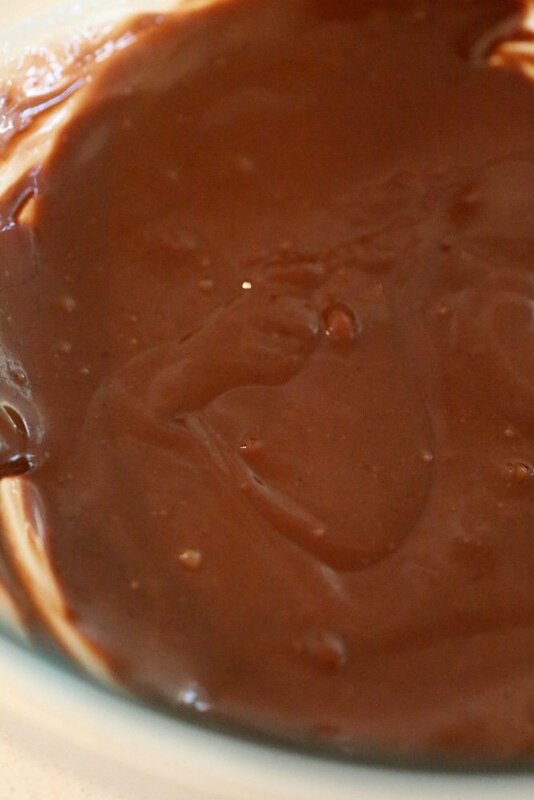 1/2 cup is about 2.25 oz solid chocolate, not melted. about 64 gms. Love these! Just made them yesterday, and both of my kids love them–I had to stop them from having more and more. A day later, they are still moist in the airtight container. Satisfying and dense without feeling overindulgent. Comes together very easily too! Thanks! Hi, I’m very new to baking with “alternative” ingredients and I have a couple questions. For the oil, if I use coconut oil would I need the liquified version of coconut oil or the solid version that you melt before you measure? And if I use arrowroot instead of corn starch will the measurements still be the same? I can’t wait to try baking these for my stepfather who has a rediculous amount of food allergies! Solid coconut oil. the oil will melt when you add it to the hot coconut milk mixture. mix well to combine well. Same measurement for arrowroot starch. Let me know how they turn out! I and this blog are vegan for ethical reasons. I haven’t used eggs in years and cannot recommend using them. Egg industry involves mass slaughter of male babies considered useless to the industry. While female chicks can replace “spent” and slaughtered female egg layers, male chicks can not lay eggs and aren’t considered the proper breed for meat. Every year in the U.S. alone, 260 million male chicks are disposed of by suffocation in large garbage bags, ground up alive in giant machines that work like wood chippers and other ways. Which is why I never buy eggs from the store. I have my own backyard chickens. I live in a community where many folks raise their own chickens and let them live out their natural lives in comfort…. (actually, we tend to spoil them. )I currently have 6 hens and 3 roosters and one hen is sitting on eggs. I hope she hatches more hens than roosters,but the boys will stay with the flock. There’s a pecking order and so far everyone’s respected it. BTW, I don’t have coconut flour,can I sub almond flour? I am from India. Which brand of coconut oil would you suggest to use. I do not understand about solid coconut oil. It needs to be deododrised? There are 2 types of coconut oil. Refined coconut oil does not have a strong coconut smell (it might be called deodorized), and unrefined or virgin which is pure coconut oil with the strong coconut smell. You can use either in this recipe. Solid is a state of the oil. Coconut oil stays solid at cooler temperatures and liquid at warm temperatures. If the oil is liquid and the recipe mentions solid or semi solid, put the oil in the fridge for 10 minutes and then measure and use. Just bought your book via Kindle. I just love it. Definitely trying this one, substituing Maple with Agave and sugar with Coconut sugar or Stevia powder. Thank you for sharing ☺. Hi!!! can I freeze brownie dough? I would freeze the brownie. Reheat in the oven or microwave and serve. Can I replace the baking powder with something else? These were delicious! That was my first time making a vegan dessert and using coconut flour, and it all turned out great. The ONLY thing I will do differently is add another quarter cup of chocolate chips, because I love biting into the chunks. Didn’t make the ganache because I wasn’t sure how. 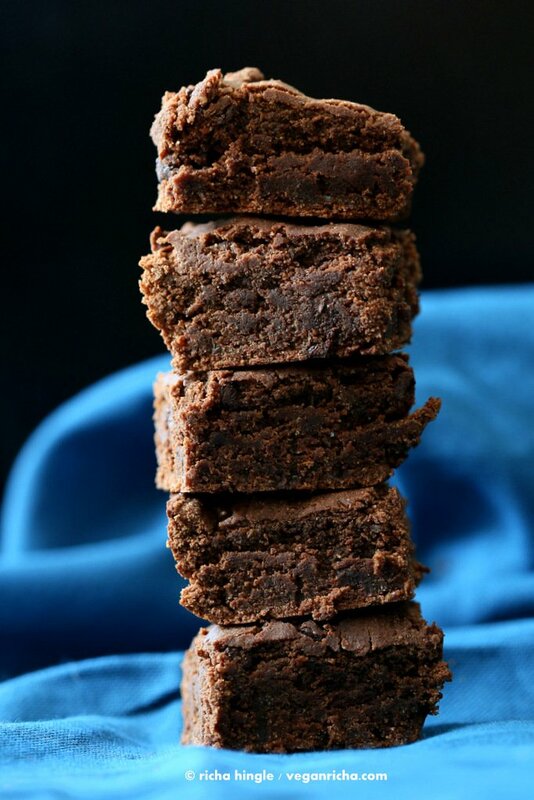 The brownies look amazing and all your other recipies that ive tried are absolutely delicious! I would love to make these. But i am not sure how you go from chocolate bar to chocolate powder? Thanks for the recipe! I made it with all 70% chocolate and it turned out great. The video was really helpful as the texture was quite strange, but I could see from the video that it was how it should be. It’s a versatile recipe in that without the ganache it feels lunchbox appropriate, but I think the ganache would really elevate it to special-occasion-worthy.